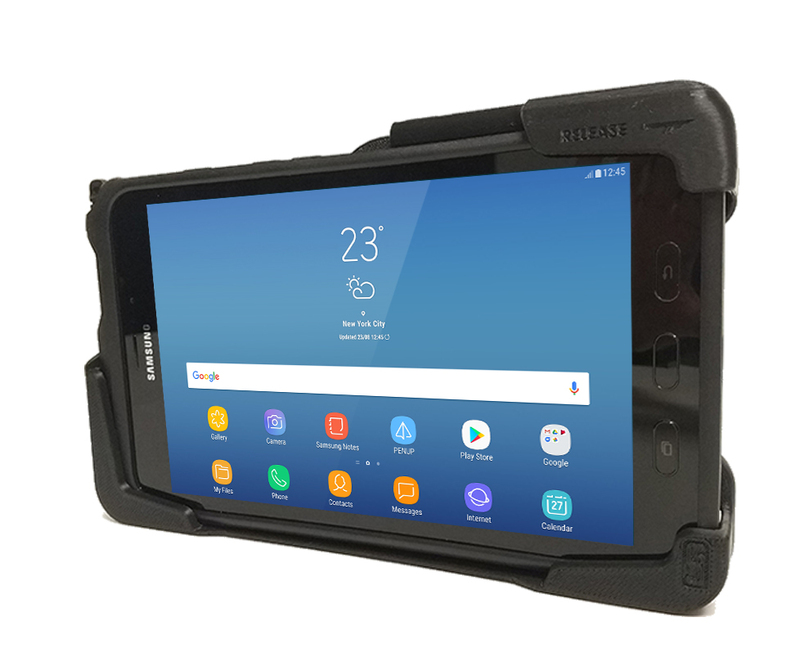 STEVENS POINT, Wis., Oct. 20, 2017 /PRNewswire/ — Gamber-Johnson today announced three docking stations designed to safely and securely mount the new Samsung Galaxy Tab Active2 tablet. The docking stations, when used along with Gamber-Johnson’s complete line of mounting equipment, are specially designed to work in vehicles such as police cars, ambulances, OTR trucks, utility trucks, and forklifts. The docking station comes in three versions: a lightweight and low-cost cradle, a fully loaded docking station with a USB port to power your keyboard or mouse, and a kit version that replaces your tablet’s battery. The Gamber-Johnson cradle version is the ultimate choice for drivers who want to keep things simple. At just 0.46 lbs. (0.21 kg), the lightweight cradle keeps a tablet safe and lets you access all the features you love about your Samsung. The camera, stylus, and all the tablet ports can be used while the computer is docked safely in the cradle. If needed, the cradle can be locked closed for extra tablet security. The docking station version has all the features of the cradle; but, when wired to your vehicle, it provides power to your tablet so it will stay charged and ready to go. It features one USB 1.1 port so you can add a keyboard or mouse to your setup. 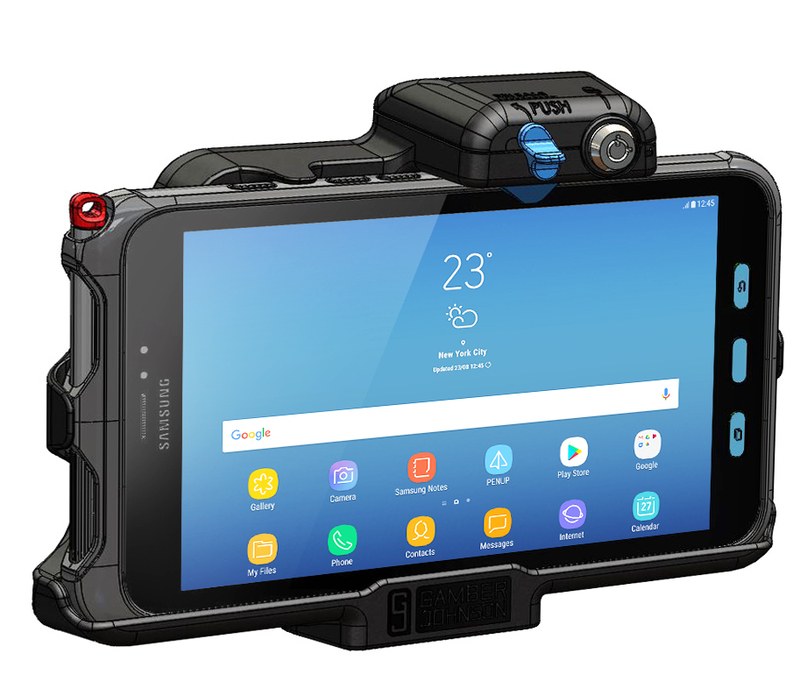 Or, for a more permanent solution, there is a docking station kit that replaces your tablet’s battery with a Power Pass Through module and charges your tablet directly from your vehicle’s power source using your docking station. Both are just 0.9 lbs. (0.4 kg). As an extra bonus, both stations work with the previous version of the tablet, the Samsung Galaxy Tab Active. All three versions have passed Gamber-Johnson’s extensive rugged environment standard, meaning they have been tested on shake and vibration tables, crash tested, and cycle tested 30,000 times to make sure they will hold up for many years. All come with a one-year limited warranty. The docking stations will be available soon and can be ordered today from Gamber-Johnson resellers or distributors throughout the world. Gamber-Johnson, along with their Canadian subsidiary PMT, is considered one of the leading manufacturers of rugged mounting systems that safely secure computers, radios, and other electronics in professional vehicles. Their systems are used by law enforcement, public safety, military, and warehouse fleets around the globe.